Established nearly 100 years ago, Acmos are a very successful Bremen-based German chemical company who specialise in cleaning agents for the woodworking and engineering trades. Below are just a small selection, so please let us know what your requirements are. Transparent, mineral oil based cooling lubricant. Free from amines and boric acid. Universally used for machining and grinding. Available in 180, 18 and 5 kilogram containers. Contains fully synthetic active agents and anti-corrosives. Guaranteed free from mineral oil and organic chlorine compounds. Highly soluble in water, forming a superior transparent grinding liquid. Available in 220, 20 and 5 kilogram containers. Contains fully synthetic active agents and anti-corrosives. Guaranteed free from mineral oil and organic chlorine compounds. Does not contain secondary amines. Contains fatty acid esters as its principal constituents. Has been developed for the treatment of steel, cast iron and aluminium alloys. Friction between the tool and the work piece is reduced, thereby increasing tool life. Available in 180, 20, 5 and 1 kilogram containers. Acmosit 62 - 30 Screw cutting paste. This product is particularly suitable for difficult metal removing processes. Notably thread cutting, where good adhesion of the lubricant to the tool is required. Available in 20, 5 and 1 kilogram containers. Acmosit 62 - 23 Heavy duty thread cutting fluid. Eminently suitable for thread cutting in steel, high grade steel, grey cast iron and light alloy. Excellent lubrication action. Also suitable for sawing, milling, drilling and reaming. Acmosit 62 - 07 Special thread cutting fluid. Eminently suitable for thread cutting in difficult high grade steels and other steels. Also suitable for sawing, milling, drilling and reaming. 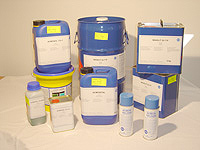 Available in 150, 20, 5 and 0.7 kilogram containers. Acmosit 51 - 17 De-watering and anti-corrosive agent with enhanced protection against corrosion. Anti-corrosive additives dissolved in mineral oil with high affinity for metal and extremely good water displacement effect.